In 1974 I was running the Circle Gallery on Madison Avenue, a few doors up from the Whitney Museum, a few doors down and across the street from Southby’s Parke Bernet. Somebody from TV land asked me to provide an art background for a talk show: artists Robert Rauschenberg and Marisol were about to confront collector Robert C. Skull (and his accountant) before the cameras). The law is out of phase with morality. Skull owned a taxi fleet. He also owned a lot of art: a collection that included a lot of Rauschenberg and Marisol. Skull bought the art when it was three figures; he was selling it in big six figures: a painting he’d paid $900 for was fetching $600,000. Rauschenberg had gotten some publicity claiming that the artist ought to be due some of the gain in value in a resale. Van Gogh didn’t get anything for painting the sunflowers; Van Gogh doesn’t get anything when his sunflowers auction at $70 million. The law is, as always, out of phase with morality. Marisol agreed, but Marisol isn’t a big talker. 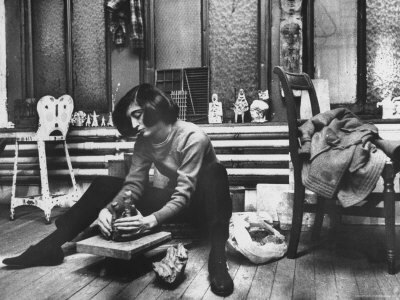 Artists like Rauschenberg, like Marisol, got invited to Skull’s parties. Such artists believed that Skull was their friend. The TV guy explained to me that neither Rauschenberg nor Marisol wanted the network to use their work. I loved the idea of decorating the TV studio as background to such a confrontation, even though the network wasn’t offering me a penny, because Circle art contrasted with Rauschenberg art the way the idea of a $900 painting conflicts with the idea of a $70 million dollar painting. Circle published popular magazine illustration art like Rockwell, like Neiman. Circle also handled a little academically respected art — I had a Will Barnet serigraph in the window when the TV guy came in. What may have been most amazing was that I slipped a total unknown into the mix. Gail Bruce’s serigraph, White Hat, had just been printed. (The scan above is of the painting, used as a maquette: I don’t have a scan of the serigraph.) I’m not sure the edition had been signed yet. I may not have yet sold a single one of them. I had a proof which I’d shrink-wrapped, and that was what I’d carried over to the studio and given second position in the display. So: sometimes the camera showed Robert Skull at an angle where the Barnet was behind him, and sometimes the camera showed Robert Skull at an angle where the White Hat was “behind” him! Circle Gallery, the corporation, was run out of Chicago. I phoned Chicago so the powers would know that I had a number of their graphics out of the gallery for a couple of hours so they could be on TV for an hour. I named the Barnet as prominent. Of course I did not name the Bruce because Circle had nothing to do with the Bruce: that was mine: her’s and mine, equally. Now, the emcee talked, introduced the situation. Robert Skull talked: he said the painting is mine once I buy it. Skull’s accountant talked: the painting was owned by Mr. Skull, what he sold it for was no one’s business (but the government’s!) Marisol didn’t talk. I never heard her say anything. Bob Rauschenberg was cited as the guy who thought that a artist should retain some interest in his work, and share at least a portion of any gain in value, but during the show he said nothing. The emcee did his “talking” for him. I stood there, silent, in love with Skull and Rauschenberg and Marisol TV’d against a background of Will Barnet and Gail Bruce. No one in the network paid any attention to me. No one told me not to walk in front of the Camera while the red light was on. I take it that everyone assumed that I belonged there, that I knew what I was doing, that I had a right to be doing it. I presume the artists thought I was with the network, while the network thought I was with the artists: or maybe I was with Skull! or his accountant! When the red light went off, Bob Rauschenberg came over and put his arm around me. “I’m so embarrassed,” he said with a sad smile. Word around said that Rauschenberg liked boys. Once upon a time pk was famous as fag bait. But I don’t think that had anytihng to do with that moment. Rauschenberg was an artist: a stimulating artist, a challenging artist. He didn’t have to say a word. A “painting” with a “goat” and a “tire” “says” lots and lots. No. He was embarrassed for not being an orator, for not being a forceful personality, on TV, while “his” “opinion” was being bandied about. Marisol was silent. I had the impression from her that she may never have said a word in public under any circumstances. Her silence was understood as agreeing with Rauschenberg: with Van Gogh, with the dispossessed, the Armenians, the Jews … with the crucified Jesus. And of course pk too was silent. I’d spoken up since grade school: only to get sent to the principal’s office, for deriding the honesty of the school. I’d spoken up in grad school, only to get eclipsed, interrupted, mis-sorted. Teaching college, I’d kept silent in my protests: all the war protesters kept silent: as we stood on the steps of the chapel. All the talking was done by the newspapers, calling us Communists, seeing that we were fired from the faculty. The administration kept silent, and fired us. Then I’d spoken up when I offered digital data basing though internetted community learning networks. The public kept silent, and kept their pockets zipped shut: while IBM, and TIME, and CERN, and eventually MIT and the Pentagon stole my ideas. And there I was: toting Will Barnet over to a major network, and slipping my Gail Bruce right in on them. Jesus spoke. And we killed him. Mickey Spillane wrote, and we made him rich, and he gave a million dollars to the Church; but did the Church give a penny of that million to Jesus? All those TV evangelicals, all those millions: millions sent by sinners, millions spent by sponsors, multi millions “earned” by sponsors … Has a penny of it ever gone to Jesus? The land we took from the Iroquois, while they tried to give us their democracy, did a penny of our revenues from that land ever go to Hiawatha? the inventor of North American democracy? Well, pk rants, no one gets it, no one recognizes it, or they do, but conceal the recognition, keep silent on it. But let’s try Rauschenberg’s subject again. Bob did manage to make it clear to the emcee who spoke for him, that he was not saying that he, Robert Rauschenberg, who’d painting a painting, consigned it to a gallery, which the gallery had sold to Robert Skull for $900, which the gallery then owed Rauschenberg 40% or 50% or 60% of, which painting had then resold at auction for half a million, some few percent going to Southby’s, the balance going to Robert Skull, some being bled off by the state, the fed, and by Skull’s accountant: leaving plenty of dollars in Robert Skull’s accounts, should get some of that gain by Skull. He Robert Rauschenberg, was a successful artist. He was himself “rich”: not by Skull’s standards, but damn well off, and famous too (and never mind how much richer he was than pk: a junkie on welfare was richer than pk, and had health benefits too). No. Rauschenberg was saying that at least some poor artist should get some portion of a work of art’s demonstrated economic appreciation. And now, having said the above, I’m too weak witted (and empty-bellied) to do this post justice: but, if I live, I be back! This entry was posted in dealer, pk Personal, stories. Bookmark the permalink.